From Leonardo DiCaprio and NOT Martin Scorsese comes the movie that will go down in history as the movie that got Leo his Oscar, even if it’s mostly pure Oscar-bait. While the views get tallied from last week’s Batman V Superman Honest Trailer battle, the gang at Screen Junkies give the HT treatment to one of 2015’s best reviewed films, The Revenant. 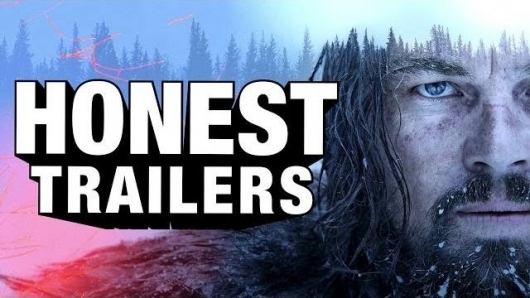 You can check out the Honest Trailer for The Revenant below. So watch as Leo actually endures the cold, sleeps in a dead horse, and eats raw fish and bison liver… “doesn’t being good at acting mean you’re good at pretending to do things?” And then the best part as Bailey changes the music and shows how close The Revenant is to MTV’s Jackass. Starring: Academy Award Winner, Leonardo DiCaprio (ahhh that feels so good to finally say), Sad Max, Domhnall Gleeson (pronounced correctly), and Sexual Harassment Grizzly… New Title: Hugh Glass and the Terrible, Horrible, No Good, Very Bad Day… Best new title ever maybe.